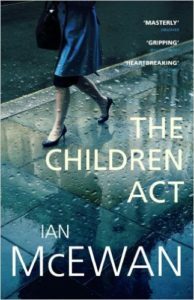 I’ve just finished The Children Act by Ian McEwan. I’ve read quite a few of McEwan’s books, and enjoyed most of them. I love his writing. It’s precise and exact. He knows the way his characters think and why they behave the way they do, and he describes it to you perfectly, intricately, so it really seems like there is no way for them to respond to their situation other than that presented by the author. His characters are brilliantly, minutely observed. This close up examination, however, can make for a sense of removal. For instance, in The Children Act, when Fiona is in the flat with Jack after the concert and she breaks down and runs from the room crying, the scene is described with such accuracy that it is like watching a film with the sound off, or reading the description of a scientific experiment. We see it all, but it’s hard to enter into Fiona’s state of mind. We know she’s upset, but we’re not there with her in that overwhelming, messy crying fit that breaks her down. The impeccable, unflappable, calm-faced judge collapses into a vulnerable woman curled up in a ball. But it’s as though we’re watching through glass. We see it, but don’t feel it. That’s the way McEwan always writes. We watch his stories happening, but aren’t invited to get up too close. We’re not supposed to get our hands messy. His books are cerebral affairs. As such, The Children Act is perfect. The central case around which the novel revolves is surrounded by many descriptions of other cases, examples of judgements that need to be made – by Fiona, by other characters in the book, by the reader. In that way we are drawn in. We are invited to sit with her at the bench and listen to the evidence over and over again. We are also invited, each time, to judge Fiona. In her work place – Did she make the right decision? Will she make the right decision again? And also in her personal life. Is she a cold fish? Is she too harsh on Jack? Is she engaged enough in their relationship? Having made our decisions, we might then ask if she is right to keep public and private so separate? Her husband has no inkling of the case that has consumed her for months, and her colleagues are completely unaware of her marital break down. Even the reader isn’t allowed in close. We never really know if Jack has hurt her deeply, or if she really doesn’t care that much. She keeps everyone out, including young Adam. And that reserve eventually has fatal consequences. Sometimes in McEwan’s books, even my favourites such as Saturday, something in the plotting has pulled me up short, thrown me out, and I’ve sat back and said, no, that wouldn’t happen. I was kind of expecting that in The Children Act. There was a slight tension in my body the further through I got, as I waited for Fiona’s ordered world to be shattered by some hitherto unsuspected bombshell from offstage left. But that didn’t happen. This time McEwan got it exactly right. The bombshell came perfectly from inside the plot. Fiona’s own fatal flaw was at the heart of her tragedy. Her reserve, her professionalism, her refusal to unbend to Adam when he reaches out to her, all rebound on her when she learns of his tragic end. And McEwan is inviting the reader once more to make judgement on Fiona. Is she responsible for Adam’s death? Or was that to do with his family, his church, his own character? Was Fiona right to keep a professional distance? I could see the end coming, and hoped I was wrong, that there might be at least some hope. But McEwan was perfectly in control and the ending he gave us was inevitable. Nothing else would have done.